On Friday 8th March, Sr Mercy at Inter Care partner health unit St Joseph’s Hospital, Limbe, contacted Diane (Inter Care, General Manager) to inform of heavy rainfall and the devastating effects on the local community. For over 1 week Southern Malawi has had severe rainfall, with more predicted. This has affected half of the country’s districts by flooding and rivers overflowing in particular the River Shire. The River Shire runs from Lake Malawi for 402km, flowing into the Zambezi River in Mozambique. Southern Malawi is home to an estimated 7.5 million people with hundreds of thousands displaced from their homes and many injured. Sr Mercy received six people on Friday 8th, whose house had fallen in on them. Two are badly injured. The Hospital is under a lot of pressure with just a backup diesel generator to power their essential equipment due to widespread power loss. Many people in the district are in a similar situation with widespread damage to their infrastructure. “It has been raining for a week now and is still raining. 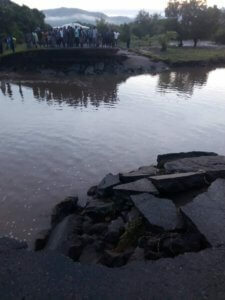 Some of the houses have fallen… There are floods in some parts of the country, bridges washed away and no electricity. We just pray that the rains will stop soon.” – Sr Mercy, St Joseph’s Hospital, Limbe. There are concerns for the people of Malawi, with floods increases the risk of contracting Cholera and Malaria. The standing water provides a breeding ground for mosquitos. In a country where malaria is already the seventh highest cause of death, this can have damaging results. This, in turn, adds additional pressure to an already fragile healthcare system, with disasters requiring additional health support from a limited supply and long-term health risks following. This is when Inter Care’s FREE medical resources are most needed! Transport of medical resources continues to be our largest expense and your support towards this cost would be greatly appreciated.